Leon A. Frechette, an industry authority, spent over 36 years in construction and 25 years as a tool reviewer. His wide-ranging interests and experience include a remodeling consulting firm, tool development and testing, and product evaluation. After eight years (1997-2005) of presenting his high-energy "ToolTALK" and "ToolTIPS for Women" shows to standing-room-only crowds from coast to coast and answering Q&As in his weekly newspaper column ("The Tool Guy") from 2003-2006 in The Spokesman Review "Home," he's redirecting his energy to focus on his many home improvement sites currently under development. His ongoing career has brought many challenges and rewards on the editorial side of the home improvement industry. In 1995 he received Stanley's Golden Hammer Award for "How to Install a Garage Door Opener," a short-subject article published in the January/February 1995 issue of HomeImage Magazine. In 2000 he received the Vaughan/National Association of Home and Workshop Writers (NAHWW) Golden Hammer Writing Award for his book "Build Smarter with Alternative Materials" published by Craftsman Book Company. 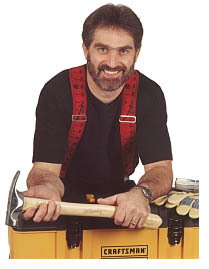 In 2003 he received the Vaughan/NAHWW Golden Hammer Writing Award for Best How-To Electronic Media for "Dress Up Your Chandelier With A Ceiling Medallion"; in 2007 he received the Vaughan/NAHWW Golden Hammer Writing Award in the Internet Category for "Bricky - The professional wall-building tool"; and in 2008 he received the Vaughan/NAHWW Golden Hammer Writing Award in the Internet Category for "Learn How to Read and Choose a Tape Measure." In 2009 he wrote a news wire feature release titled "Do-It-Yourself Tips On Silencing Squeaky Floors" for North American Precis Syndicate, Inc. (NAPS). This piece ran from January 2010 until August 2011. NAPS honored him with a Golden Thinker Award and a Certificate of Excellence for Superior Achievement in the Media Relations. These awards are given each year to individuals who create feature releases that are picked up the most by America's newspaper editors. The number of placements a release achieves is a great measure of its success. The results of his release, 1,396 placements, have been absolutely extraordinary. "The Tool Guy," a weekly newspaper column in The Spokesman Review "Home"
Contact Leon through eMail at crs@asktooltalk.com. To see his full bio, click here!